Saw the video of these and jumped in with both feet and ordered 6 (3 sets) of them for our garden. Had a problem with one after lots of sunlight but eventually it found itself and came on. They look really effective in the garden and will hopefully be ordering more soon to run the other side. Great effect - we cant stop staring at them!! Already have the standard size and are just as pleased with this mini version. We live in the West of Scotland not renowned for sunshine but these are very effective. These were bought as a gift but i did try them out. I already have 2 of the solar lanterns and they are very bright and realistic. Will get some for myself at some point. Bought six of them to replace old ones. Very pleased with the products, seem to be well made. The delivery service from Solar Centre was excellent. Also bought two of the large ones and two Sphere lights which are also very good. Got these as I have already had the large ones for a year. Great effect and well admired. Would recommend. Thought Iâ€™d exhausted all areas of my garden to install any further lights from Solar Centre but thankfully found a spot for these super torchlights. Very good size. Charged them as instructed for 3 days. Working perfectly and flame is so realistic. As always the service from Solar Centre is 1st class. Lights arrived very quickly after ordering. Pleasure dealing with this company. Wanted something for small memorial garden for my late wife. As per review title "Just the Job"
These look great in our small garden. We already have a couple of the larger ones so these mini ones have gone into plant pots and look very effective. They are a wee bit different and we've had a lot of positive comments on them. Easy to put together. Delivery was quicker than expected. Would definitely recommend (but keep an eye on prices for the large and small as they vary quite a lot). Arrived on schedule, stuck them in the ground and as the sun went down the torches came on. 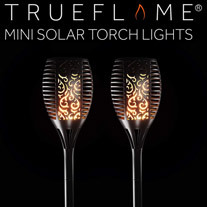 The flame effect is great and the wife was so pleased she has ordered two more. The weather has not been very sunny so the torches are not fully charged yet, when i first tuned them on one last longer before than the other ,but now i am charging them fully as instructed so this is not a fair review,when they lit at first they looked very realistic.so just waiting for a few days and then i will try again.,i have solar powered fairy lights from Solar Centre which are superb so i dont see any reason why the torches dont work as well when fully charged. Lovely product, something different and interesting to look at. Easy to install and seem well made. Arrived on time and well packaged. Already have two of the larger ones so these compliments them nicely. Let them charge for a couple of days and they fired up no straight away. Really impressed with the quality of the lights and the flame effect is excellent. Would definitely recommend. Good value for money, I have 4 of the larger ones dotted around and so have put these into pots I have planted up. Well made and half the price of the large version. 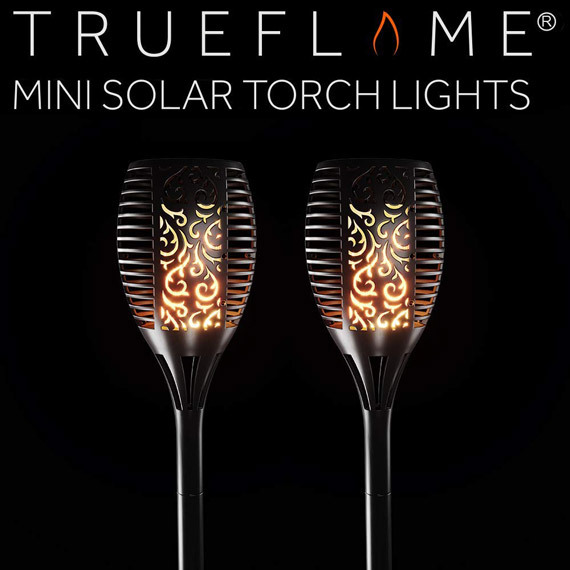 Still a good size and gives an excellent light, although doesn't last as long as plain solar lights. A great product, easy to set up and delivery next day - what could possibly make this any better?